Marketing analytics—the practice of measuring, managing and analyzing marketing performance—unleashes a world of marketing potential for marketers. Utilizing marketing analytics is a sure-fire way to unlock the return on investment (ROI) of your marketing efforts. Understanding marketing analytics allows marketers to be more successful at their jobs. Learning what the metrics associated with various marketing channels really mean allows them to interpret the data and improve the performance of landing pages, blogs, social media, emails and more. 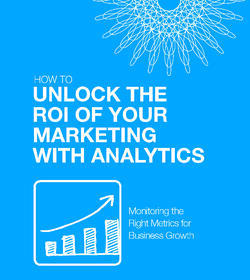 If you want to learn more about marketing analytics and improve each of your integrated marketing channels’ performance, then the free eBook, “How to Unlock the ROI of your Marketing with Analytics” is right for you.